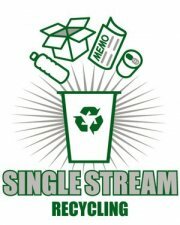 GO GREEN WITH SINGLE STREAM! The City is proud to provide single stream recycling to its residents through a partnership with Stutzman Refuse Disposal (SRD). SRD can be contacted at 620-662-2559. Place only loose recyclables in the cart -- DO NOT BAG. Include: Aluminum and steel (tin) beverage and food cans; Plastic beverage, food & soap containers (recycling symbols #1 thru #7); Glass containers (all colors of food & beverage jars and bottles); Newspapers (including inserts), magazines, junk mail, office paper, books, phone books, catalogs, cardboard and pasteboard. Shredded paper, other plastics not listed above, other glass, ceramics, Styrofoam, batteries, oil containers or hazardous chemical containers, plastic bags, and paint cans. Recycling routes run every other week on the same day as your trash is picked up. Residential waste and recycling should be picked up on Thursday and Friday. Your trash will be picked up at curbside, so be sure to place your recycling cart at curbside on your scheduled pick-up day too. It's that easy! Yard waste can be disposed of at the City compost site. Another option is to mulch and create your own compost pile.